News-Sentinel.com sports reporter Tom Davis has been writing on the Fighting Irish for nearly two decades and is taking a daily look at each recruit leading up to the traditional National Signing Day (Feb. 7). Allen is a Georgia native that will add to the already incredible defensive secondary depth that Notre Dame has accumulated over the past couple of recruiting classes. He suffered a hand injury last fall, which cut short his senior season for Lassiter High School (Marietta, Georgia), but he was still effective on both sides of the ball. Allen made 54 solo tackles (three for a loss) and picked off three passes, while offensively he hauled in 14 receptions and scored four times. 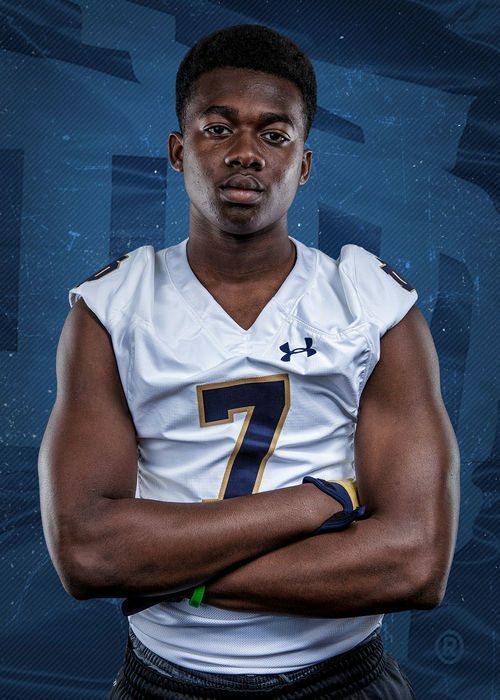 He participated in the recent U.S. Army All-American Bowl in San Antonio and has potential to contribute to the Notre Dame special teams, as well as defensively. Allen has good size (6-foot-2, 215 pounds) already and that will just become more and more of a positive trait with work under Notre Dame strength coach Matt Balis. The Irish coaching staff wanted a versatile defender who could play the ball in the air, yet still be a good tackler with physicality and Allen checks those boxes. Allen has been rated as high as the fifth best safety in the entire country by ESPN, while Rivals and 247Sports had him as the seventh best. Rivals thought of him as the eighth best player over all from the talent-rich state of Georgia, while 247Sports had him as the 69th best player overall in the entire country. Allen joins a deep and talented secondary that has a nice blend of youth and experience. Notre Dame gains the addition of Navy transfer Alohi Gilman at safety next fall and veteran Notre Dame coach Brian Kelly has already stated that Gilman would have started last season if eligible. In addition to Gilman, Irish starters Jalen Elliott and Nick Coleman return, as do Isaiah Robertson and Devin Studstill, as well as Jordan Genmark-Heath, D.J. Morgan and Nicco Fertitta. Only Coleman and Fertitta will be in their final year of eligibility in 2018. “He was the first guy that we saw that had the ability to cover man-to-man, play the ball in the air, and get the ball down on the ground with his size,” Kelly said last month of Allen. “That was the trait that we had to have in this class. It was a must, must, must. It was underlined like five times. We have to find this player. For more on college football, follow Tom Davis on Twitter at Tom101010 and on Facebook at Thomas Davis.